Glass E-liquid tank with replaceable bottom dual coil atomizer and removable drip tip. The glass tank with aluminum reinforced case keeps the gravity fed atomizer delivering the rich dense vapor hidden within your E-liquid to intensify the flavor and your vaping experience. 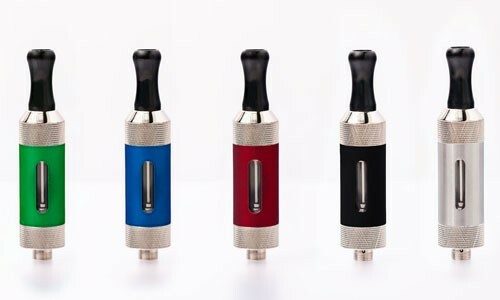 Constantly moist atomizer eliminates the dry burnt taste from high voltage and prolonged use. Perfect for heavy duty and outdoor use with a sharp polished look. Packaged with 1 glass tank, 2 replacement atomizers, and 1 removable drip tip. 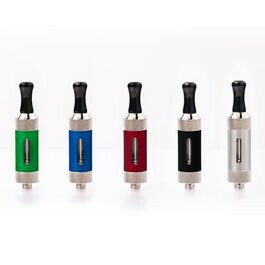 Available in multiple colors in a small 2.0ml tank and a larger 3.5ml tank capacity.